Managing success: Man City right to ax Mancini? As the end of another UEFA Champions League campaign draws to a climactic close, it’s traditional to assess those that stood above others with their contribution of exceptional performance, inspired tactics and delivery of dramatic moments. The ritual of placing an outstanding player or masterful manager on a pedestal to marvel at their achievements is an annual exercise of adulation, but there is a flip side to the tale of the season that this ignores. Tradition, according to Christian scholar Jaroslav Jan Pelikan, is “the living faith of the dead”, and so - with this thought as a guiding light - this column will focus on the negative and malfunctioning instead. 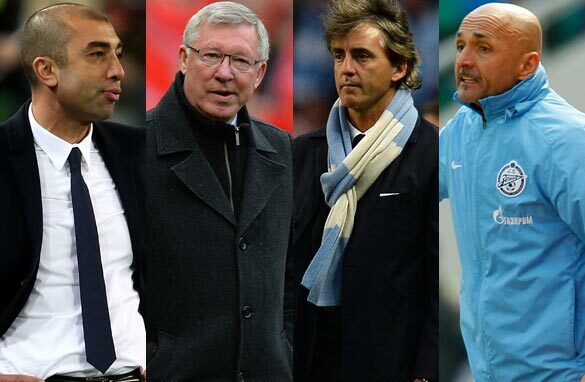 Namely, which manager failed most to live-up to their pre-season goals? After all, this is the question that preoccupies the myriad of club owners across Europe. He may have been the greatest manager to grace British football and a two-time winner of the Champions League but "Fergie" had seen diminishing returns from his forays into Europe in the last two seasons of his tenure. A sizeable $103m were spent over the last campaign bringing in players such as goal-getter Robin Van Persie and goal-stopper David De Gea. The blue half of Manchester are relative newcomers to Champions League combat, so that may be a mitigating factor for failure, but what they lacked in experience they surely made up for in player spending power. An outlay of over $230m in the last two seasons by Italian coach Roberto Mancini, not to mention the capture of the English Premier League title, had seen expectations soar as high as the players’ wage bill at Eastlands. And sadly, for their followers, this campaign saw the disappointment of a winless group stage and stunted progress in Europe once again. The 54-year-old Italian manager joined the Russian side in 2009 but in a show of enhanced ambition the national champions splashed out $140m in the last year on player firepower, including the signings of such luminaries as Brazilian striker Hulk and Alex Witsel of Belgium. Never before have the reigning champions of Europe been booted out of the competition at the first opportunity, but such was the fate of 2012’s unlikely title-holders from London. The football world marvelled at the ability of the 42-year-old manager Di Matteo to cajole a dispirited team and defeat the mighty Bayern Munich in last year’s final. *Updates made in light of the sacking of Roberto Mancini by Manchester City. Fergie the worst? no, he is the best by beating Real Madrid with an average team! you should make a poll with worst ref in the Champions League, we all know who is getting that one. I think Mourinho should have made the list. He has not been successful in Europe with Madrid. im not convinced Sir Alex should be included amongst the flop list. in this season's exit, Man Utd were hard done by. A contentious referee decision to say the least. 9 out of 10 pundits believe Nani should not have received a straight red, which ultimately paved the way to Real snatching victory. Fergies European consistency over his tenure is second to none. Granted he should have sown up more titles however at this level the margins are so slight anything can happen. Even if Mancini has still a long way to go for becoming one of the best coaches, he's still a very good coach. This article seems to me more like a Nationalistic propaganda by the British Sport Press Association in favor of the local coaches.